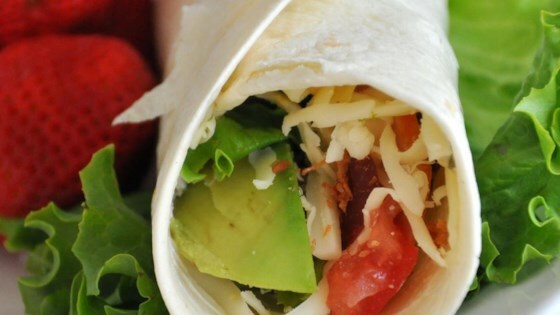 "These light and tasty wraps are great for lunch, or slice them smaller and they make wonderful party appetizers or great little after-school snacks." Mix together the cream cheese and Dijon mustard until smooth. Spread each tortilla with about 2 tablespoons of the cream cheese mixture, spreading to within 1/4 inch of the edge of the tortillas. Arrange about 1/4 cup of shredded lettuce on each tortilla, and press the lettuce down into the cream cheese mixture. Place 2 turkey slices per tortilla over the lettuce, and sprinkle with 2 tablespoons of shredded Swiss cheese. Top each tortilla evenly with tomato, avocado slices, and crumbled bacon. Wheat tortilla was wonderful. A little to mustard for me. Added fine chopped onion and no bacon for taste and keep the fats down. Will eat again.